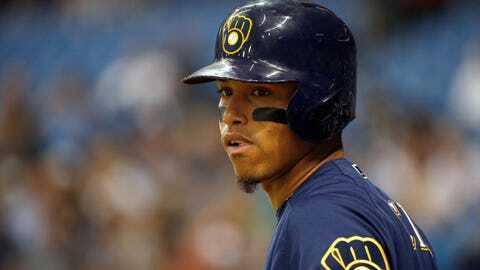 Orlando Arcia will once again work on his hitting in Triple-A. The Milwaukee Brewers sent the shortstop to Colorado Springs on Saturday and recalled pitcher Aaron Wilkerson. Arcia had been farmed out to Triple-A on May 25 but was summoned back five days later after Tyler Saladino landed on the disabled list. A defensive stalwart, Arcia hit .203 with no extra-base hits in 66 plate appearances upon his return and owns a slash line this season of .197/.231/.251. Including his time at Colorado Springs, Arcia hasn’t recorded an extra-base hit since May 18. Brad Miller is starting at short for the Brewers on Sunday. Eric Sogard and Hernan Perez can also play the position and Saladino is expect back shortly. Wilkerson has pitched in eight games for Colorado Springs with seven starts, owning a 2.08 ERA. He appeared in three games for the Brewers in 2017, with two starts, allowing four runs on six hits with one walk and seven strikeouts in 10 1/3 innings.